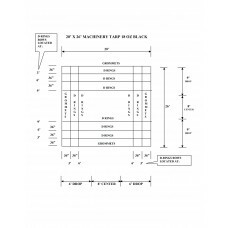 We stock a 2 Machinery Tarps, one with 5’ drop in Gray 18 OZ & one with a 6’ drop in Black 18 OZ Vinyl with grommets on the hem and 3 Rows of D-rings along the length and 2 rows across the width. Custom construction, sizes and colors available. 18'W X 24'L Machinery Tarp 18 OZ Gray - 5' Drop Tarp. Grommets on the hem, every 24” with 2 rows of..
20'W X 26'L Machinery Tarp 18 OZ Black - 6' Drop Tarp. Grommets on the hem, every 24” with 2 rows o..